My artworks include kinetic sculptures, videos and diagrams. I employ DIY, allegorical and autodidactic methods and modes of representation to engender visceral, uncanny and humorous encounters and to explore political and philosophical material. I have had solo exhibitions at Piper Keys and Five Years and have exhibited in many group shows in the UK and internationally including at the ICA, Greene Naftali and BAK. I often work collaboratively and am currently a member of the Capital Drawing Group and the Social Morphologies Research Unit. I have published articles in journals such as Third Text, Art Monthly and Mute, including on the politics of art and art education. 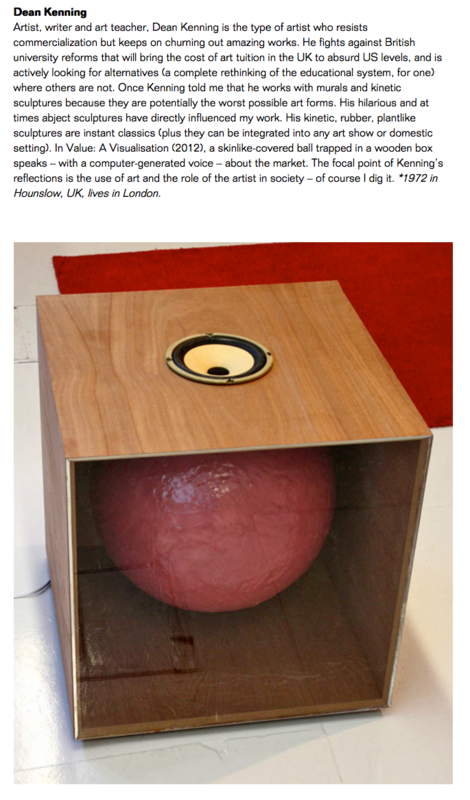 I am a Researcher at Kingston School of Art and also teaches Fine Art at Central St Martins. 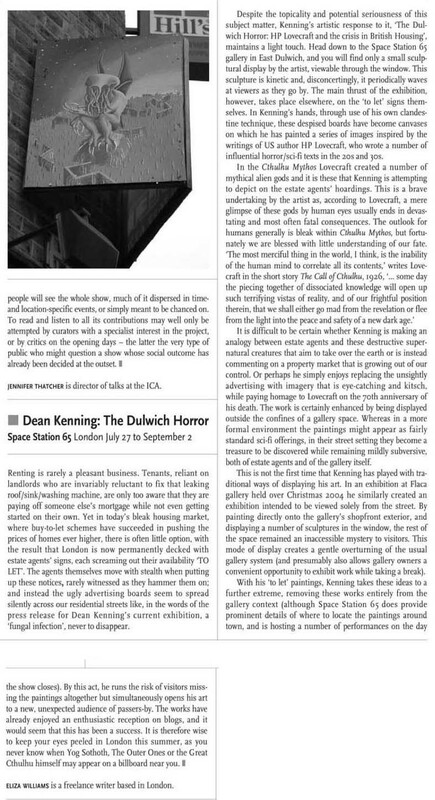 The Dulwich Horror is Dean Kenning's witty response to the housing crisis. Inspired by the cosmic horror of cult writer HP Lovecraft, Kenning has taking the novelist's most weird invention, the Cthulhu Mythos - a collection of supernatural monstrous entities - and has tried to realise these creatures by painting them on agents' letting boards. The results can be seen across London. Green ogres with mangled hands and slimy tentacles watch passers-by from their lofty perches, postmodern gorgons clutch at bricks and mortar. Lovecraft's preoccupation with human powerlessness is revealed in this series of faceless fiends.